in what he has chosen." So you want to learn read the Lenormand! Bravo! 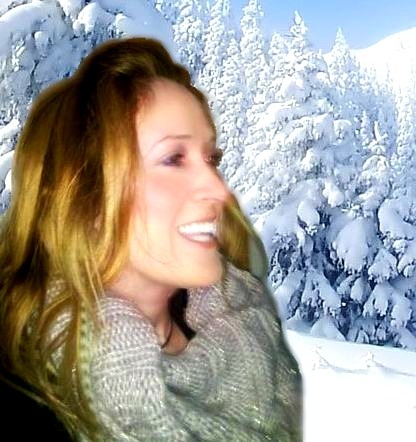 It is an enticing and amazing journey of synchronicites and learning. The cards read with blunt precision and amazing detail. The first question people typically ask is, “What deck would be best one to start with?” All it takes is one deck, and you'll want to make it a working deck that appeals to you as well as one that has the necessary important features of a good reading deck. This blog will be limited by which decks are still available at the time of this writing, as new, limited edition decks seem to come out about once a month now and may not be available in the long term once they sell out. 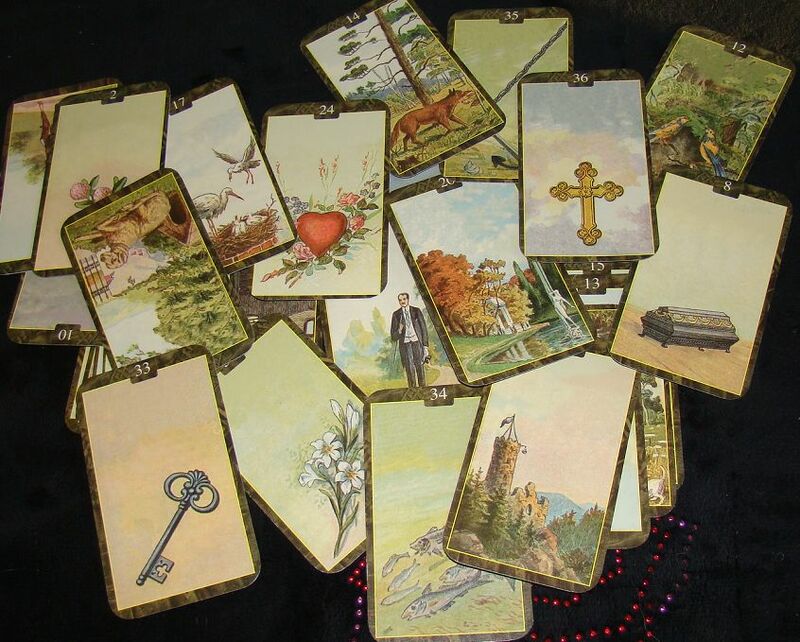 Lenormand reads differently than tarot. The processes of reading Lenormand and how you use the cards becomes a sentence flow, and the cards create combinations with each other, so core meanings of two cards merge to become one modified energy. With Tarot, the symbolism on the card has everything to do with what you see or feel in it: the expressions on the faces of the people in the cards, the weather, the action….it all comes through when you’re reading that card, so the imagery is very important for that system. Not so much with the Lenormand. With the Lenormand, there is a stricter semantic structure to the cards. For example, when you learn what meanings you want to attribute to a specific card, no matter which Lenormand deck you use, you will be applying *exactly* the same meaning to the cards, despite the deck used. So Bouquet will always mean “Gifts,” no matter which deck you happen to choose. The image on the deck is less relevant. The meaning you have already designated to the card it is where you go to find your information. "Mouse" will always be "thief," no matter how sweet the rodent looks on the deck. The meaning is the meaning (is the meaning). Dark/light sight of Clouds: In a spread of cards, the card on the light side of the clouds indicates that something confusing is clearing. If on the dark side, you're in the thick of it. Scythe direction - the scythe direction shows what is being cut. Facing significator - Some people use the direction the significator is facing to determine which direction in the spread is the future. I do not use this system. For me, the right side of the spread is always the future, the left is the past, regardless of any imagery in a significator. Some readers pay attention to which side of the Coffin is undraped. Art or images that appeal to you: What is aesthetically “comfortable” to your eyes? Smaller cards are better than larger cards if you plan to do large spreads. 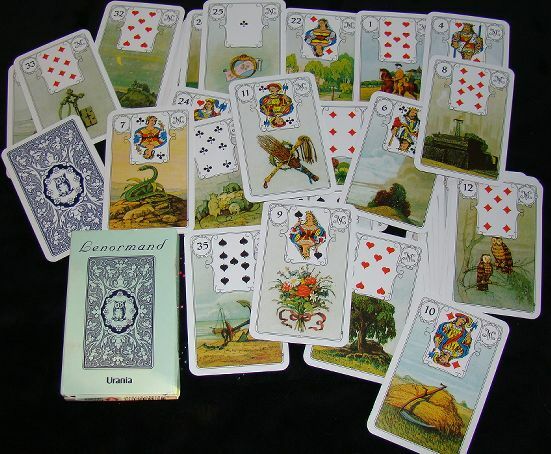 Eventually readers will probably want to aim toward the Big Mama Spread of the Lenormand, “The Grand Tableau.” This magical spread uses all 36 cards, which will take up a significant amout of space and be more difficult to scan with they eyes with large cards. Numbers on the cards (1-36) are helpful once you start using more advanced systems like Houses, so you may want to find cards that are numbered. I’ve hand-written numbers on cards I’ve purchased that did not have them already printed on the card. Some people feel you must start with one of the classic decks to learn properly. I disagree with this. Since the meanings of the cards do not change with the deck, a modern deck will bring you exactly the same messages. That said, many modern decks may have images that don’t clearly identify the key word of the card. The classics tend to have less vague or “cutesy” themes, so the images are more point-blank. 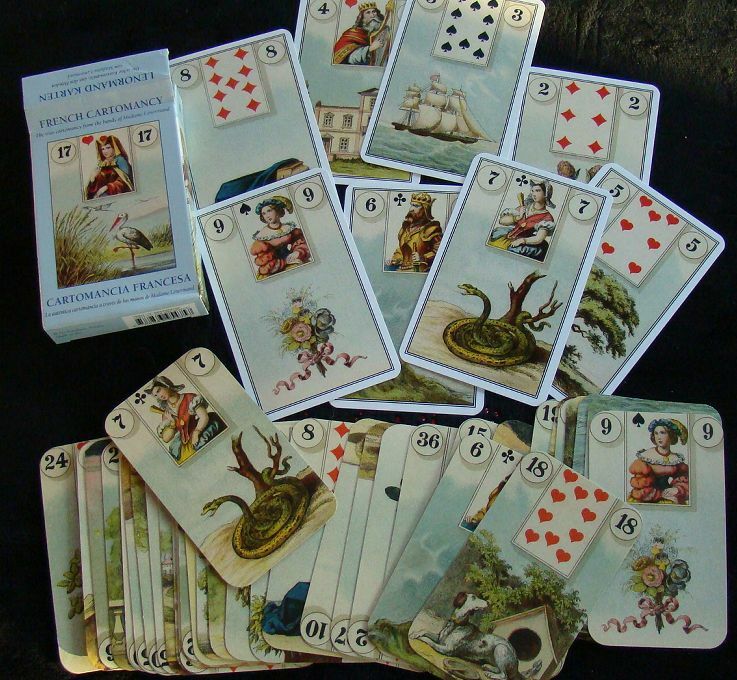 1) The French Cartomancy Lenormand, available at The Book Depository. 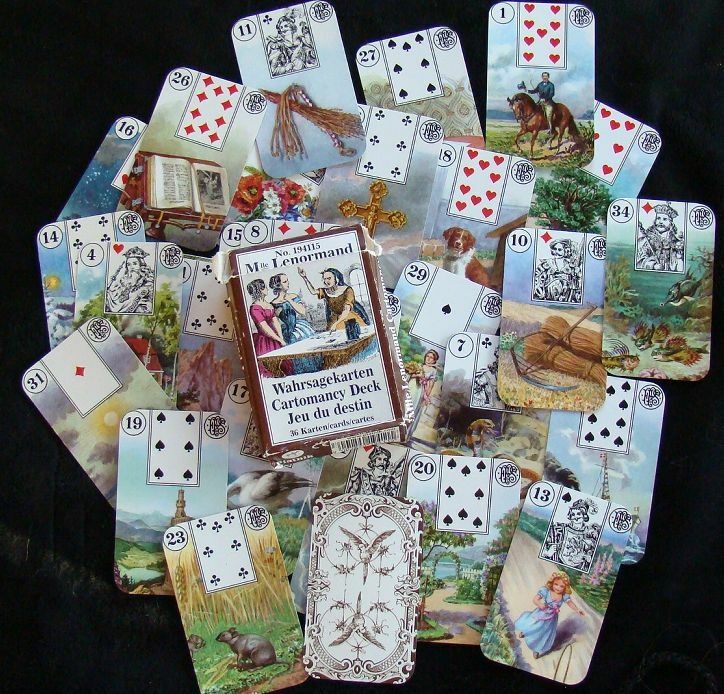 (One drawback: this is one of the larger Lenormand decks. I typically remove the borders as shown in the row of cards at the bottom of this image, to reduce the size). Drawback: I personally don't like the garish green borders, so typically I remove all of the edges. Below is one of my decks were only a little of the border was removed. There are also no playing card inserts on this deck should you decide to use them later. (While it has been a limited edition, Melissa has kindly reprinted the deck so it could become available to more people). (This deck has again sold out). Technically, you could even write simple words on evenly sized pieces of paper as shown below (I’ve done this while on vacation and realizing I left my Lenormand decks at home). They would give you similar meanings. You can also draw the pictures or cut them from magazines. If you want to give the Lenormand a go, but you don't have any cards and aren't sure about buying, there are some free online decks you can download and print out right at your computer (yep, it’s legal!). 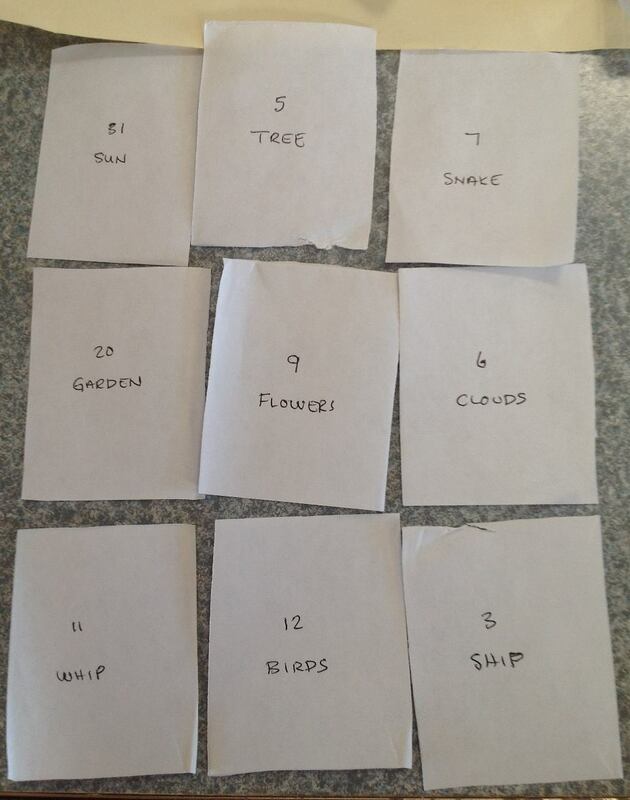 On THIS blog post of mine, scroll halfway down to find a list of free Lenormand decks you can print at home. What About the Images of Playing Card Inserts? 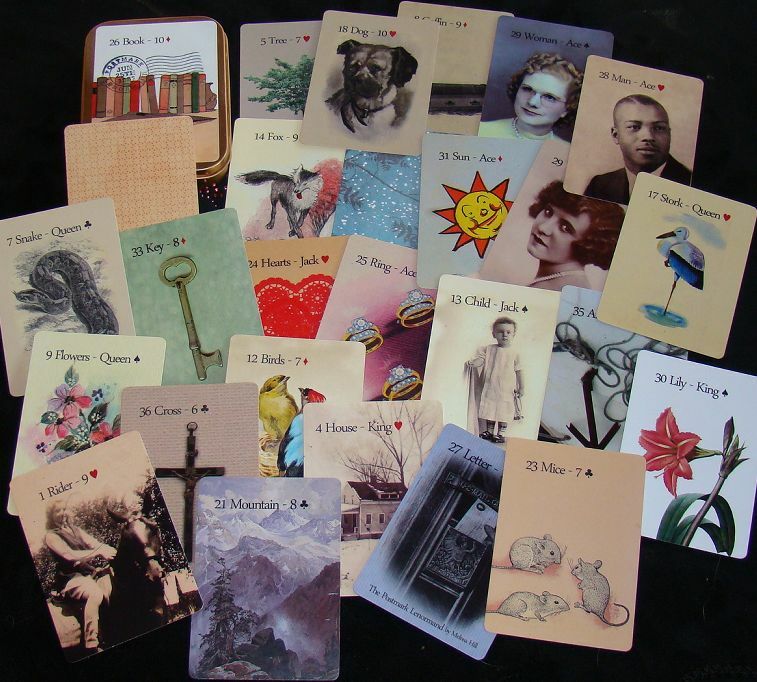 Some but not all Lenormand readers may make use of the playing card inserts you'll notice on many Lenormand decks. Many readers, if they use those inserts at all, will use the Court Cards to represent people. Others may go deeper, but this is not the norm. 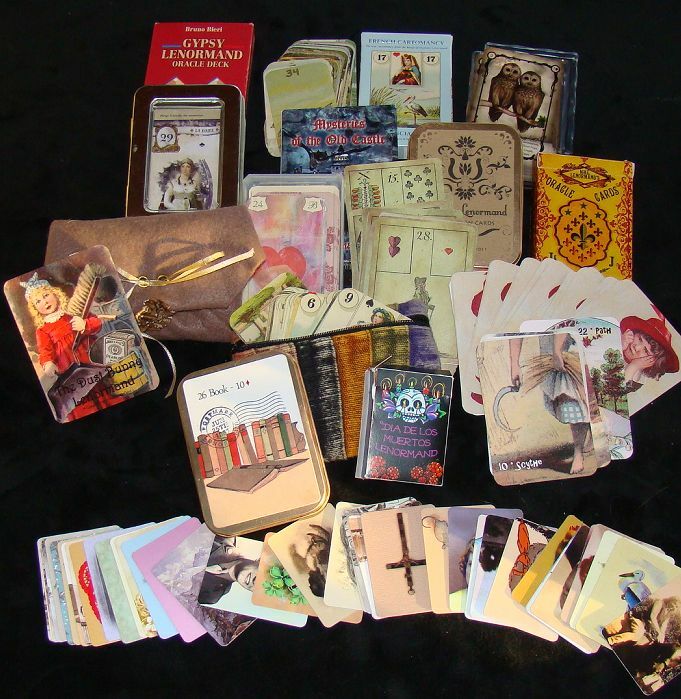 Most Lenormand readers, believe it or not, disregard the playing card inserts other than those courts (but you may end up being one of the people who does use them). If you only want to buy one Lenormand deck, ever, I'd suggest getting a deck with them so you can do some future experimenting. But know that the cards can read fabulously without them. Learn more about the secrets of reading tarot at our award-winning educational tarot podcast. See a listing of all show topics HERE.